The dragonfly has the distinct honor of bearing compound eyes. She sees through the illusions of light and form into a dimension deeper than our daily reality. The human eye holds one lens per eye in its design. In comparison, Dragonfly possesses 30,000 lenses per eye. Due to advanced skills in Flicker Fusion Frequency, Dragonfly’s visual experience of the world differs tremendously from our own. Flicker Fusion Frequency is the rate at which an eye can distinguish separate static images before the eye fuses them together into motion. Humans perceive roughly 50 static images per second before the images blur together. 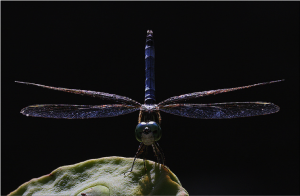 Dragonfly is able to perceive around 300 individual static images per second giving her an advantage in perceiving motion. So, if you took a Dragonfly to the movies, she would see the film for what it really is; a slide show of photographs. This optical triumph is trumped by her astounding skills of flight. Believed to be the very first flying life form on Earth, she is also the most advanced in aviation. She is a hover craft with extraordinary precision and maneuverability. Her long narrow body is carried by two sets of wings both moving independently of each other giving her the ability to stop in mid air, travel backwards and forwards, and blaze through the sky at around 30 mph. She is one of the oldest living beings on Earth with an ancestral record found in rocks dating 300 million years ago of giant descendants bearing wingspans 2 1/2 feet long… the first legendary dragon. Dragonfly has definitely downsized since prehistory, but her shape and form have become a mythic icon within the human psyche, calling forth the iridescence of magic and illusions. Iridescence is a color phenomenon which does not utilize the common materials known as pigments we find in rocks, plants, and our own skin. 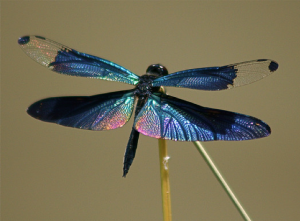 Iridescence is achieved by the architecture of Dragonfly’s wings and body which bends and refracts light in such a way as to create seemingly other worldly vibrancy. Dragonfly is a dance of light. This attribute beckons the ability to get others to see what you wish them to see. You could meet Dragonfly Medicine at a club on Saturday night and walk right past them at the grocery store on Sunday. They are master illusionists and the life of the party. Their presence brings a phosphorescent color to any event, lifting it from the mundane into the remarkable. But the experience of magic and wonder by design is brief and intense. Dragonfly knows that awe is not a long term state in which to dwell. She also reminds us that those seeming bursts of sudden beauty, those overnight smash hit top-of-the-charts successes often cloak years of hard work behind their illusions. A good book lasts about a month. A good film lasts two hours. A good song lasts ten minutes at best. But the time behind these experiences involves years of work and transformation from within the artist. The lessons behind the magic of any spectacle is best illustrated in the stages of Dragonfly’s life as she moves from water to air. The dragonfly spends most of her life in the developmental stage known as nymph form. Nymphs live in still waters for several years, embodying gills and living life as fish do. Then one fine day, this young nymph is suddenly gripped with an unstoppable conviction to climb out of the water, crack open her childhood form and emerge from the husk of her old self into her adult being, Dragonfly. This process of metamorphosis is a profound metaphysical teaching for the human spirit. Cracking through and emerging from her own old body shell, Dragonfly lights the stage of the world for a few months before returning once more to the Earth. Her life is brief and spectacular. And with it she shows us that it is possible to completely transform a way of being using only the intelligence found within. When the answers to your questions may seem outside of you in books and teachers, remember that the power to find those answers lies within you. It is your own conviction that truly teaches you. No one ‘gives’ you answers. You take them when you are able to see them. That is the learning process which allows all things to be your teacher. Dragonfly shows us how to undergo deep profound change on a cellular level. This medicine of transformation is shared by all living creatures. Our own processes of metamorphosis, though much less spectacular, are still observable in the awkward stages of puberty. Life is change. Change is inevitable. To resist becoming what nature intends causes pain and disease. Resisting the flow of change out of fear of danger, ironically puts you into much greater danger than if you yielded to the truth of your being. When caught in the illusions of stasis, you are vulnerable to surprise attacks from the ever on rushing world around you. Dragonfly knows from experience that change is growth and ‘growth’, on a cosmic level, sometimes involves downsizing to allow for balance. Let the old fall away and transmute into a new expression of self. She asks you to break through the mental constraints keeping your colors dull. Crack open the old identity and become the next experience. She is an insect. Her medicine is not rational and will not spend much time in the thinking brain. You will not be able to have long cozy journal discussions with her about the process of change as you might with Bear, or Whale, or any of our mammal relatives. She will flash through your mind in a sudden knowing out of the ‘seeming’ blue. She defies logic. She is the power to summon new energy into being. Insect medicine is a psychedelic journey for the human mind far removed from our mammalian comprehension. If you take mushrooms or other hallucinogens, you have placed dragonfly medicine into your visual cortex and entered the world of illusions. You find that nothing is real or solid, save the witness that is you. 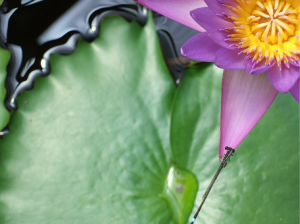 When Dragonfly medicine is out of balance there can be an excess of illusion and an excess of substances. So estranged is the relationship between humans and insects that if you look at the artistic renderings of ‘aliens’ in film and television you will find that insects are the primary source materials for the disturbing shapes that touch our primal fears. Insects make our skin crawl. Why? Because their skin crawls and cracks open. That’s what they do. They are a living teacher of the process of dying and rebirth. We turn insects into monsters when we fear what they teach us about the nature of life. Bugs may feel alien to us, but they are not aliens. They are, ironically, one of the oldest most successful designs the planet ever grew. We are the youngest design. The distance between us is a fascinating journey.